This entry was posted in Uncategorized on 25/08/2015 by Fowlers News. 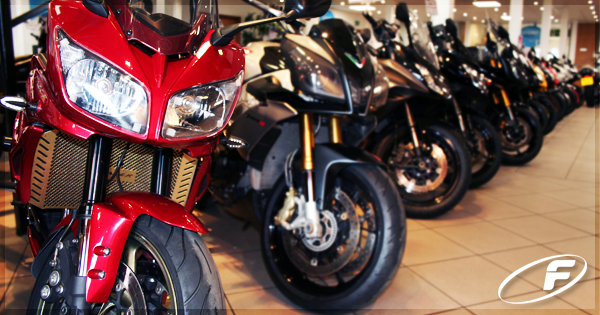 0% Finance† on all Pre-owned Bikes at Fowlers from the 1st September – 30th November 2015! 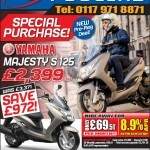 Due to further negotiations with Black Horse motorcycle finance, this campaign is now available from 1st Sept 2015 until 30th November 2015 inclusive!! That’s a whole 3 months of 0% finance† on all of our qualifying pre-owned vehicles!! With over 300 pre-owned machines to choose from, there has never been a better time to own the machine of your dreams. Simply put down a 50% deposit on the pre-owned motorcycle of your choice and enjoy the benefits of the remaining balance over 36 months, completely interest-free!! 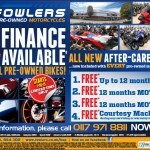 When you buy a pre-owned motorcycle or scooter from Fowlers you also get some really useful FREE extras – up to 12 months warranty (depending on age of machine), 12 months MOT (if required) and your next MOT will be FREE, too. Plus FREE use of a courtesy machine during any service/warranty work undertaken by Fowlers. In addition to bikes from Aprilia, Honda, KTM, Moto Guzzi, Suzuki, Triumph, Yamaha, Piaggio and Vespa, you’ll often find pre-owned motorcycles from BMW, Ducati, Harley Davidson and Kawasaki. Come in and see for yourself or browse online. †Finance is subject to age and status; indemnities may be required; written details available on request; terms & conditions apply. This entry was posted in Offers on 24/08/2015 by Fowlers News. They say that true passions are hard to satisfy and, as a biker, you’ll understand this more than anyone. There’s always a better ride-out and a better rider within you. So, it’s time to take your passion to the next level and Free The Rider Inside You. 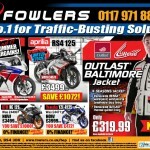 If you visit the Fowlers Honda showroom between 29-31 August, you’ll receive up to £500 off any bike over 300cc*, including the legendary Fireblade or the born-to-explore VFR800F. All you need to do is register for your unique offer code. *Subject to terms & conditions. This offer ends 31st August 2015. 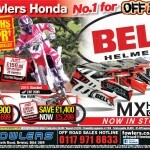 This entry was posted in Events, Honda, New Bikes, Offers on 24/08/2015 by Fowlers News. The Ultimate Suzuki Demo Day! Suzuki’s National Test Ride Road Show rolls into Fowlers on Saturday 15th August, giving you an opportunity to try their diverse and exciting variety of bikes. You could test the new GSX-S1000, described by MCN as “the naked GSX-R1000 K5 we all hoped it would be”. If you have a taste for adventure, there is the “brilliant value for money” V-Strom 650, as well as the bigger 1000cc versions, with ABS and traction control as standard! 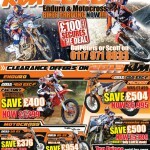 Bike availability may differ at each event, so please contact your local dealer for more information. Demonstration rides require an agreed booking and are solely at the discretion of the dealer. With the paper counterpart for UK driving licences now redundant, those willing to take a test ride at any of the events must show a photo-card driving licence, their national insurance number and a print-out of their licence details so licence checks can be carried out. Click Here to obtain your licence details for printing. Please note this printed copy must be no older than 30 days. You may be asked for a deposit and further dealer terms and conditions may also apply. Please confirm your request with the dealer before travelling. This entry was posted in Demo Day, Events, Fun, Suzuki, Test Rides on 10/08/2015 by Fowlers News.